This document, remarkably, has survived for 71 years in its original envelope, and was found among other papers, at the house of one of my honorary 'Uncles' after he died. Harry Shore was, in actual fact, my mother's cousin (probably several times removed) and lived at no. 44 King Street from the late thirties until his death in the 1980s. It's not clear, which 'Mr Shore' the bill is addressed to. Harry himself was in the army during the war, so this Mr Shore is most likely to be his father. A perusal of census forms from the period would confirm this. 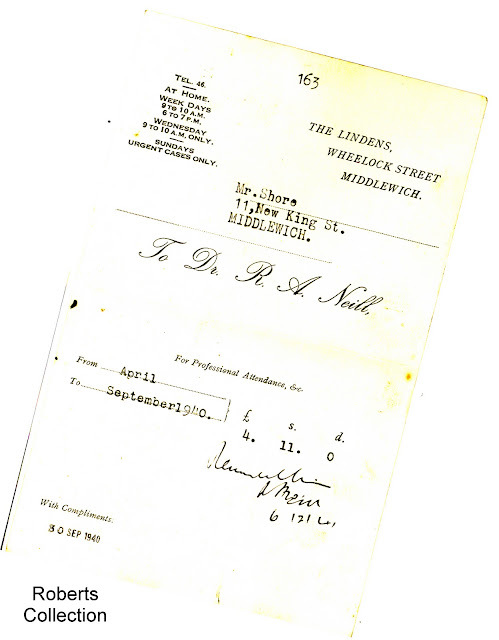 The bill, dated exactly one year after the start of the war, is for 'Professional Attendances &c from April to September 1940', a period of six months, so it would appear that Dr Neill was being consulted throughout someone's long illness. 1940 was eight years before the introduction of the NHS, and this is a salutary reminder of how things were before that invaluable but beleaguered organisation came into being. In 1940 £4 11s was a lot of money, even for six months of health care. 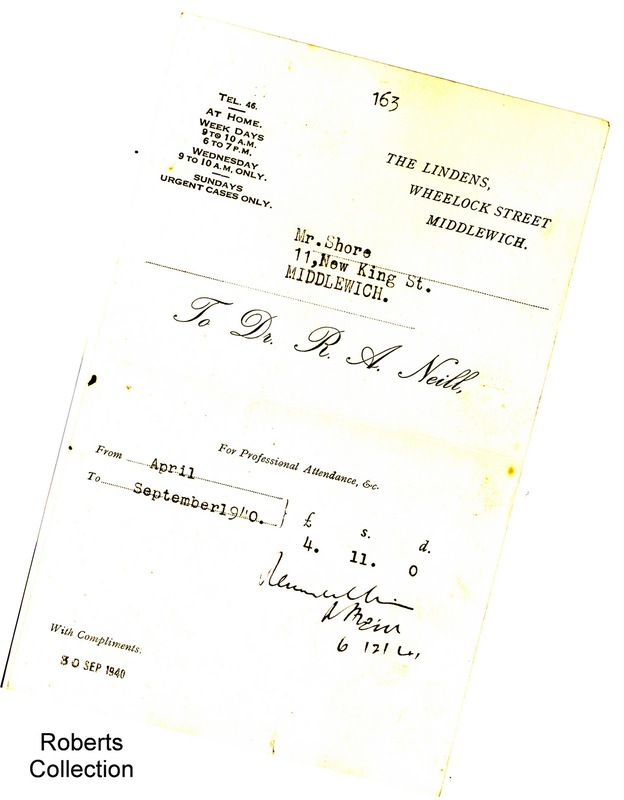 Dr Neill was, of course, a popular and highly respected doctor in Middlewich well into my time. But where was 'The Lindens' in Wheelock Street? The only 'Lindens' I know of is associated with 'The Limes' in Chester Road, which was a children's home when I was young. Was 'The Lindens' the name for the surgery we all remember where the 'Cafe Med' was in later years? I don't understand the phone no. and 'at home' on the billhead. 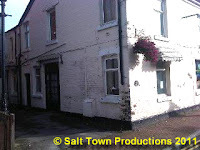 We moved back to Middlewich in 1947 and as far as I can remember Dr Neill's surgery was always in that big house next-door-but-one to us but I thought Dr Neill lived in Nantwich Road and his (later) partner Dr Graham lived near Stanthorne crossroads. He wasn't our doctor. When we returned to Middlewich the formidable Dr Murphy had retired and our doctors were Brown and Jones at Ivy House surgery in Wheelock Street but they had houses in the Chester Road/Croxton Lane area. When the Americans moved into Byley camp the house was owned by a Mrs Haydock who ran it as a sort of lodging/guest house, although the surgery was still separate at the front. I never knew the house as 'The Lindens' - a name which, like you, I associated with The Limes, but I'm sure it must have warranted a name.